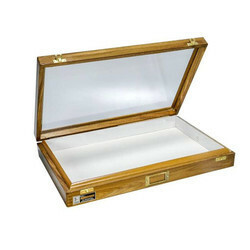 We are a reputed name in the industry, devoted towards offering the best quality array of Insect Storage Box of Teak Wood. EVA sheet pasted on the inner sides of insect storage box for pasting and pinning insects. For pinning of insects both top & bottom insides. Teakwood frame with sunmica top & plywood bottom is finished in lacquer polish. Top & bottom lined with 8 mm thick EVA sheet. Inside glazed white with art papper. Raised wooden wall with holes for insecticide, inside bottom to make box air- tight and pest proof. Specifications as above but top with glass. Size 45 x 30 x 7.5 cm. Size 38 x 25 x 7.5 cm. Size 30 x 23 x 7.5 cm. For pinning of insect both top and bottom insides. Teakwood frame with sun mica top. Top and bottom lined with thick EVA sheet. Rasied wooden wall with holes for insecticide. Teakwood frame, sun mica top. Top and bottom with EVA sheet over which adjustable strips provided for stretching insects. Strips can be fixed at one place with screws and fly - nuts & index card holder, clips and handle. 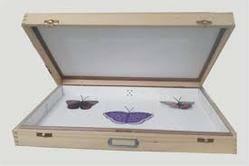 Suitable for taking in field where the insects can be stretched on the spot and can be kept in the box.